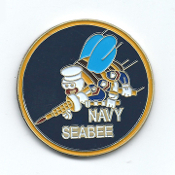 Our colorful Seabees Challenge Coin is two sided, made with premium metal. Finished with multi-color fired on enamel on the front and a die struck back with an area to engrave your name and battalion. The coin is approximately 1-5/8 inches in diameter. This is a beautiful coin you will be proud to own. Sorry, we do not offer engraving. Engraving can be done locally. Order or your own coin for your collection or as a gift today!